Second Division League: Bengaluru FC B put eight past Hindustan FC! Home / Indian Football / Second Division League / Second Division League: Bengaluru FC B put eight past Hindustan FC! 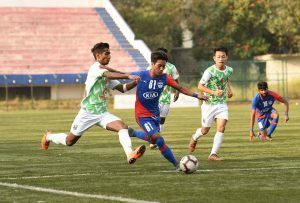 Bengaluru FC B extended their winning run to three games, hammering Delhi-based Hindustan FC 8-0 in a completely one-sided affair at the Bangalore Football Stadium on Friday. The win took Bengaluru FC B’s tally to 9 points as they cemented their position at the top of Group-A standings in the Second Division League after they sealed their biggest ever win in the competition. While Naushad Moosa’s boys controlled the entire game, it was a brace each from Parag Shrivas (16′,43′) and Leon Augustine (51′,57′) along with goals from Advait Shinde (11′), Myron Mendes (20′), Emanuel Lalchhanchhuaha (60′) and Altamash Sayed (61′) that gave Bengaluru FC a well-deserved win. Dominating proceedings from the word go, Bengaluru FC B broke the deadlock in the 11th minute through a set piece. Altamash found Myron on the right, whose low cross into the box was finished off by Advait on the second attempt after his first was blocked by the keeper. Five minutes later, Myron with a long ball found Parag free on the left who ran past his marker before finishing off at the far post with a low finish. Myron had a penalty kick saved by custodian Varun Bisht in the 19th minute before making amends a minute later with a close-range finish at the far post on Parag’s cross from the left. The Blue Colts missed another penalty at the half hour mark when Altamash hit his effort from the spot wide, before Hindustan FC missed the third penalty of the afternoon when Jaskaran Singh too fired off target after Aditya Patra had brought Franko Paul down. The hosts finally made it 4-0 minutes from the breather when Parag completed his brace heading home Altamash’s corner kick in from the left. Bengaluru FC struck four in quick succession in the opening quarter of the second half. First it was Leon who poked home from close on Advait’s pass after Myron’s effort from outside the box came off the crossbar in the 51st minute. Six minutes later, he completed his brace tapping home Parag’s low ball in from the left. Emanuel and Altamash scored two in as many minutes from outside the box around the hour mark to make it 8-0 for the Blue Colts. The home side had quite a few chances in the remainder of the second half, but some poor finishing and last-ditch defending from the visitors meant the score remained unchanged. The league now breaks for three weeks with Bengaluru FC B resuming their campaign with an away game against Hindustan FC in Delhi on February 25. Previous VIDEO – Mumbai City FC: Fun time during training! Next Chhinga Veng FC score 3-0 win over Mohammedan Sporting!